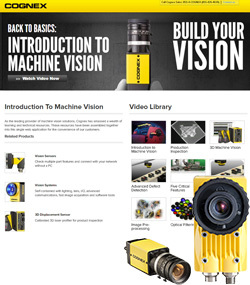 As the leading provider of machine vision solutions, Cognex has amassed a wealth of learning and technical resources. For your convenience, these resources have been assembled together into a single interactive web application that can help you choose the right vision system components, and get the most out of them. No matter your experience level, these resources will help you get better machine vision performance. Whether you're in the market for a new vision system or looking to improve the performance of an existing one, the vast array of Cognex expertise accessible in this resource kit will help. Do you have a vision project or a requirement for barcode readers?